Louis Armstrong New Orleans International Airport Parking Your car can pay for your parking space. Louis Armstrong New Orleans International Airport Parking : Parking can be a smooth experience if you select TravelCar as your trusted parking partner. We have the cheapest parking rates in the region. We are fully present at the Louis Armstrong New Orleans International Airport. Our parking lots are offsite, away from the hustle and bustle of the airport. Keep in mind that we are just about ten minutes away from the airport terminals. We have frequent shuttles that operate between our offsite parking lots and the airport terminals. In New Orleans, we are available at the Louis Armstrong New Orleans International Airport, surrounding cities and business districts. We are also stationed at seaports in the region, train stations, nearby hotels and airports near Louis Armstrong New Orleans International Airport. Louis Armstrong New Orleans International Airport is a Class B international airport based about 16 miles from New Orleans. It is located in Jefferson Parish, State of Louisiana, in the United States of America. Louis Armstrong New Orleans International Airport is the 37th busiest airport in the United States of America. In the State of Louisiana MSY is the most active, followed by Baton Rouge Metropolitan Airport. The city of New Orleans owns and manages the airport. MSY stands on 1,500 acres of land. MSY is also known as Moisant Field and New Orleans International Airport. The airport is a focus city of Allegiant Air. Airlines at MSY fly to Canada, Panama, Mexico, Germany, The United Kingdom, and The Dominican Republic. In 2017, Louis Armstrong New Orleans International Airport facilitated 111,689 aircraft operations and 12,009,512 passengers. 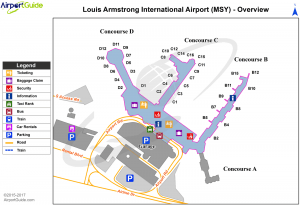 Louis Armstrong New Orleans International Airport comes second after Schiphol International Airport in being the airport lying at only 1.4 meters above the sea level. Schiphol International Airport in the Netherlands lies at 3.4 meters below the sea level. Significant international airports near MSY airport include Austin-Bergstrom International Airport, Nashville International Airport, Memphis International Airport, Hartsfield Jackson-Atlanta International Airport, and George Bush Intercontinental Airport. The table below shows big cities with high population surrounding the Louis Armstrong New Orleans International Airport. TravelCar leads in offering the cheapest parking rates at MSY and the surrounding areas. MSY has 3000 parking spaces for short-term parking, 2500 parking spaces for long-term parking, a Cell Phone Lot, 800 parking spaces on the Credit Card Lot, and Disabled Veteran Parking. Compare deals from other similar companies, the cheapest parking rates at TravelCar are unrivaled. Concourse A Concourse A has six gates: A1, A3, A5, A6, A7, A8 Un-operational at the moment. 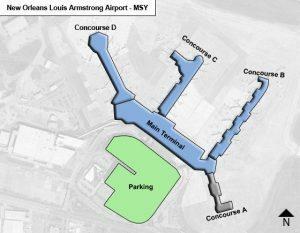 Louis Armstrong New Orleans International Airport has two terminal buildings with four concourses. At TravelCar we mind your travel convenience. We make sure that there are minimal or zero hiccups in your movement to and from Louis Armstrong New Orleans International Airport. In as much as we give you the cheapest parking rates in the region, we mind the well-being of your vehicle and your peace of mind. Offsite parking is a secure way of keeping your vehicle away from possible traffic madness at on-airport parking lots. Additionally, there are minimal height restrictions on cars. TravelCar parking spaces are offsite but very close to the airport terminals. We have several shuttles that frequently leave for the airport terminals. The shuttle service is free of charge. Our valet services make it easier for you to beat that deadline and catch your flight in good time. Moreover, valet parking adds a touch of class to your travel experience, great value for your money. Cost-effective parking packages that allow you to save up money. Prompt valet services and luggage assistance. Necessary car maintenance like a car wash, tire changing, oil changing and car detailing at the parking lots. Free shuttle service to the airport’s terminals. A diversity of automobiles to choose from for rental purposes. Travel with a reputable brand verified by Trustpilot. We have an active customer support system that is available 24/7 to assist with your reservations. Class is defined by your taste for the fine things in life. Valet parking is a parking service where a TravelCar attendant assists you in the parking of your automobile in a designated spot. The designated spot is usually reserved for a client who has booked a parking space on our website. The valet attendants are well versed with different car models and will, therefore, do a wonderful job. Moreover, they will assist with your luggage to the shuttles heading to the airport terminals. The courteous valet team at TravelCar will redefine your parking experience to one that you will always cherish. Nothing compares to fast and efficient response to messages from our customer service team. We are online 24/7, all days of the year. Customer support is in place to ensure you get proper guidance on our availability in your location, the booking process and any other concerns you may be having. We hold your feedback in high regard and hope to see some of your reviews. Since flights are scheduled in good time, so should your airport parking arrangements. Plan in good time and book a parking slot on our website at www.travelcar.com. You may stand to win discounts on parking prices and valet services. Always remember that the cheapest parking rates are at TravelCar parking slots. For travelers seeking public means of accessing Louis Armstrong New Orleans International Airport, the easiest way is travelling by road. Two bus companies have direct connections to MSY airport from Downtown New Orleans, Greyhound Bus and Regional Transit Authority’s Express bus.